Some universities have miscellaneous fees for registration, books, and other incidentals. And there are travel and living expenses to consider. But all of that might be a small price to pay for tuition-free degree and what could be the adventure of a lifetime. These countries have free-tuition universities for international students. Taiwan is a modern society with vibrant and rich heritage culture. 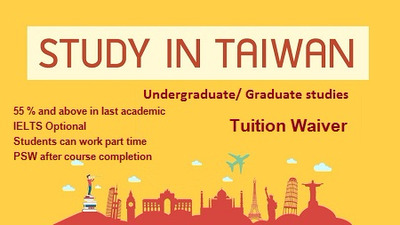 People are friendly and hospitable who are accepting towards new ideas and different culture.There are many top ranked universities in Taiwan which offer scholarships in various subjects in undergraduate and graduate studies.The type of scholarships are tuition fee waiver, accommodation and stipend as well depending upon the score and requirement of the student. Public universities are tuition-free to international students, but Portuguese is the language of instruction. Tuition is free for programs in which the language of instruction is Czech. The land of the midnight sun has 14 universities and 25 institutes of technology, all supported by the federal government. Many programs are offered in English. More than 6,000 degree-seeking international students study in Finland each year. Home to world-class higher education with many programs taught in English, Germany offers free tuition to international students in many of its universities. Why not study in the birthplace of academia, democracy, and the Olympics? Studying in Greece is generally tuition-free, with some exceptions. The downside is that undergraduate courses are taught in Greek, so you’d have to brush up on your alpha-beta. No tuition is charged at Iceland’s four public universities. About 5 percent of students are from outside Iceland, and a growing number of courses are taught in English. A true multicultural environment, the University of Luxembourg, which is the only university in the country, provides instruction in French, German, and English. It charges no tuition for foreign students. With few exceptions, there is no tuition charged for state universities and university colleges, many of which offer courses and programs in English. About 15,000 foreign students study at Norwegian institutions. Tuition is free for everyone at public universities in this Central American country, where two universities are internationally ranked—Universidad de Panamá and Universidad Tecnológica de Panamá. The language of instruction is Spanish. If none of these countries are of interest to you and you are willing to pay just a little more than nothing, check into the public universities in these countries, where tuition fees are negligible, depending on course of study: Argentina, Austria, France, Malaysia, Mexico, Spain, and Turkey. Till today, there have been 14891 visitors (24972 hits) on this page!